Two troublesome weeds that look like small pine trees at some point in their development are the field horsetail and the Russian thistle. The former is a native of North America and Europe and can be toxic to grazing animals. The latter, introduced by Russian immigrants to the American West, changes in appearance from miniature pine to the bushy tumbleweed known for blowing through ghost towns. 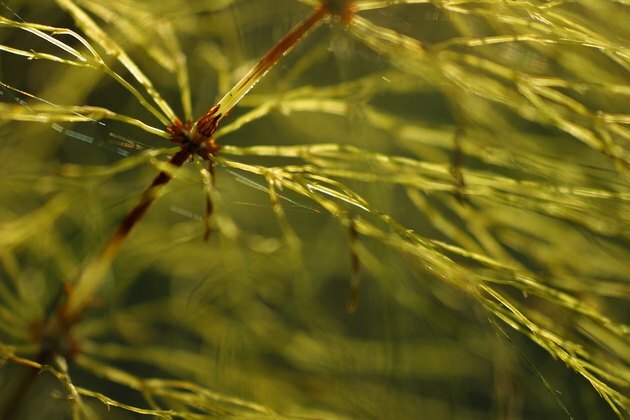 In its vegetative stage, field horsetail, pictured here, resembles a tiny pine tree. Field horsetail (Equisetum arvense) causes problems with its extensive tubers and rhizomes. In its vegetative stage, this perennial grows plume branches that resemble tiny pine trees–or horsetails–and these green stems grow up to 2 feet tall. These plants pose problems for farmers, depending on the crops they plant: Healthy fields of grain often stave off infestations, but slow-growing species and short vegetables may not be vigorous enough to compete with field horsetail. The University of Wisconsin Extension's recommendations for managing the weed include quarantining, enhancing drainage and planting more-competitive grain varieties. Additionally, nitrogen works for grass crops because they react more vigorously to the fertilizer than field horsetail does. Eradication may be possible after a few years of tilling and planting a competitive crop. Herbicide applications include primisulfuron and MCPA. Applications for areas without crops include sulfometuron and clorsulfuron. Diclobenil also is used in some instances. Russian thistle (Salsola tragus) is a common pest species in the western United States, where it infests roughly 100 million acres. A native of southeast Russia and western Siberia, the annual was introduced to the United States in the 19th century. It often grows in vegetable fields and in disturbed areas such as beside roadways. This plant's seedlings resemble small pine trees, but once they're older, Russian thistles are bushy, bristly and grow up to 6 feet tall. These plants break off at ground level when their stems dry, and the wind blows the tumbleweeds across the landscape, enabling the plants to scatter seeds. While cattle can eat the young plants, Russian thistle still causes considerable problems. For instance, the species diminishes yields of crops such as alfalfa, and the plants harbor pest insects. Also, tumbleweeds can be dangerous to drivers and are a fire hazard. Control is difficult; methods include mowing, burning, and planting competing species. Blister mites, which target only the Russian thistle, are another possible control. Also, pre-emergent herbicides such as atrazine can keep Russian thistle from germinating. Postemergent herbicides are also used, but when the plants are still seedlings. John Friedlein has been a full-time writer since 1998. As a reporter and columnist for several newspapers, including a central Kentucky daily, he won numerous first-place Kentucky Press Association awards. Friedlein earned a Bachelor of Arts in psychology from the University of Louisville.